HOLIDAY DISPLAY / PHOTO OPPORTUNITY at the Hartwell House Inn (312 Shore Road) Take your photo with the magical "Peanuts Gang on Ice" created by Innkeeper, Charlene Taubert. LOVE FOUR PAWS at Junebug's Beach House (17 Perkins Cove Road). Pawprints on Your Heart Fund Raiser. "Wear this necklace to celebrate the ones that have left paw prints on your heart. The ones that have taught the meaning of unconditional love, loyalty and furry snuggles." Purchase this Animal Lover Paw Print Necklace while helping dogs and cats in need! These beautiful necklaces from our friends at Spartina 449 are the perfect holiday gift for any animal lover. Just $36 and 100% of the proceeds will be donated to animal rescue organizations in Maine. The best kind of gift for the holiday season is the kind that gives back! We will also be serving yummy treats for dogs and their humans, too! OPEN HOUSE at The Lazy Daisy (45 Shore Road). Enjoy hot cider and cookies all weekend and a sale of 50% off most clothing. 10am-5pm: OPEN HOUSE at Hutchins Antiques (166 Main Street) Come enjoy some hot apple cider and light refreshments while browsing through an electric mix of vintage and antique finds from 65 dealers. In addition to our antique selection, we also offer a wide variety of jewelry and gifts. 7am-1:30pm Saturday and Sunday: HOLIDAY TREATS and DISPLAYS at The Greenery To Go (369 Main Street) Visit upstairs for a Last Hurrah sale of beachy and coastal items for your holiday tree. Find an assortment of holiday pastries, hot chocolate lattes, peppermint whoopie pies and other seasonal goodies as well as an Expresso Bar! Enter the raffle for a $25 Gift Certificate! 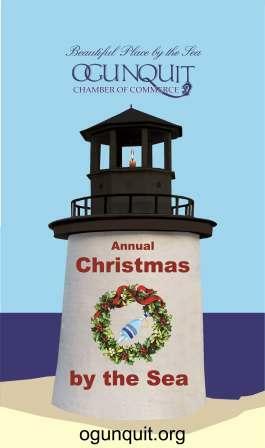 6:30pm: TREE LIGHTING AND CAROLING at Perkins Cove. Sponsored by Ogunquit Parks and Recreation Committee. 7-8pm: CONCERT at Ogunquit Baptist Church (157 Shore Road). Wells High School Select A Cappella group performs. Free admission. 8pm: COMMUNITY CHRISTMAS PARTY at MaineStreet Ogunquit. 21+ party. 8:15pm: TOWN TREE LIGHTING at Veterans Park. Join us in caroling and enjoy some warm drinks and cookies. Weather permitting. 9am-noon: GOODY BAG GIVEAWAY at Bangor Savings Bank (Main Street). Stop by Bangor Savings Bank to pick up bag of coupons, brochures, cocoa, earmuffs and tchotchkes. 9-11am: VISIT WITH SANTA upstairs at the Fire Station (School Street). Have your photo taken with Santa and pick it up later at Ogunquit Camera Shop. One photo per family. 9:30am-2:30pm: BASEMENT BAZAAR downstairs at the Dunaway Center (23 School Street). Can't figure out what to get for that hard-to-buy-for person? Find a little bit of everything and something for everyone at this bazaar. 10am-3pm: ANNUAL ARTS & CRAFTS SHOW at the Fire Station on School Street). Proceeds benefit Ogunquit Fire Rescue. 11am-1pm: TASTE THE SEASON upstairs at the Dunaway Center (23 School Street). Taste a variety of foods (including lots of chowder!) from local dining establishments. Bring a donation for our local food pantry or animal shelter. Admission: $10. Enjoy seasonal entertainment by local performers Shelli laTorre and Rob Duquette. 11am-3pm: MIXED CARGO SALE at Gypsy Sweethearts, (30 Shore Road). More than fifteen artists and crafters selling their wares! Original art, jewelry, wreaths, knit items, baked goods and more. There will be wine available by the glass for your shopping enjoyment. 10am-2pm: MEET THE ARTIST at Abacus Gallery, (213 Main Street). Nationally known calendar artist Dana Heacock will be signing 2019 Abacus calendars and a selection of his artwork will be displayed in the gallery. 1-3pm: WINE TASTING at Perkins & Perkins Wine & Cheese Shop (478 Main Street). Featuring wines for the holiday table and for holiday gifts. 1-4pm: OPEN HOUSE at Ogunquit Heritage Museum (Obed's Lane). Holiday decorations, creches and menorahs, plus refreshments. 2-3pm: KIDS' ORNAMENT AND CHRISTMAS CARD MAKING downstairs at Ogunquit Baptist Church (157 Shore Road). We'll bring the supplies; kids bring the creativity! Drop in to make an ornament or card to take home or send to Grandma (or to Santa). 2-5pm: WINE TASTING at Village Food Market (230 Main Street). Featuring great wines for the holidays. 2-5pm: PARADE PARTY at The Front Porch (9 Shore Road). Enjoy the best view in town of the Christmas Parade. Experience the warmth of our atmosphere as you sing along to show tunes before and after the parade. 2-6:30pm: HAPPIEST HOURS at Northern Union (261 Shore Road). Sit around the fire pit to watch the parade along Shore Road. Complimentary cider and donuts. 2:45-3:15pm: COMPLIMENTARY HOMEMADE COOKIES AND MAINE MAPLE COCOA at the Hartwell House Inn (312 Shore Road) Christmas music, complimentary homemade cookies and Maine maple cocoa made and served by innkeepers dressed as Victorian Dickens Christmas Carolers (while supplies last!) Watch parade from this location as the parade passes. 3pm: COMPLIMENTARY TREATS AND WARM DRINKS at Veteran's Park. Share some Christmas cheer while you watch the parade. Treats provided by Aland Realty. 3-4pm: CHRISTMAS PARADE Entrance of Perkins Cove to intersection of Beach St. and River Rd. Presented by the Village Spirit Committee. Weather permitting. For more information, contact the Village Spirit Committee at leannecusimanocontact@gmail.com. 4pm: OGUNQUIT OCEAN RESCUE POLAR PLUNGE at the Main Beach. Come support Toys for Tots and cheer on our Ogunquit Ocean Rescue Service as they brave the wintry elements. Members will plunge into the ocean in Polar Bear fashion with the hopes of ensuring a Merry Christmas for all. Please bring unwrapped toys, donations, and plenty of good cheer! 4:30pm: BONFIRE at Main Beach. Warm up in front of the bonfire while you get ready for the fireworks display. Please note -- due to property safety concerns, parking will not be available in the Main Beach Parking Lot after noon on Saturday. Parking will be available at the Lower Lot, on River Road. Weather permitting. 5:30pm: FIREWORKS! A magnificent fireworks display will be shot from the Main Beach Parking Lot. Please note -- due to property safety concerns, parking will not be available in the Main Beach Parking Lot afternoon on Saturday. Parking will be available at the Lower Lot, on River Road. Presented by the Village Spirit Committee. For more information, contact the Village Spirit Committee at leannecusimanocontact@gmail.com. 6:30pm: LIVING MANGER at Ogunquit Baptist Church (157 Shore Road). Beautifully performed by members of Ogunquit Baptist Church, this living nativity reminds us of the true meaning of Christmas. Weather permitting. 7-8pm: CONCERT at Ogunquit Baptist Church (157 Shore Road). Barbershop back by popular demand. Not just a quartet, but a choir! Seacoast Men of Harmony perform. Free admission. 11am-3pm: HOLIDAY MARKET AT THE MEETINGHOUSE at the Historical Society of Wells and Ogunquit (938 Post Road, Wells). Bring your kids and you'll jump back into time together and make old fashioned games and crafts to give as gifts, take a "Family Fun Tour" of the Museum, and enjoy the perfect spot to watch the Southern Maine Christmas Parade with free hot cocoa and snacks. FMI: 207-646-4775. Sponsored by Crickets Corner Toys and Kites of Ogunquit, Maine. 2pm: WELLS CHRISTMAS PARADE in Wells. Wells Plaza to Wells Junior High School. 5pm: UGLY SWEATER PARTY upstairs at the Front Porch (9 Shore Road). Do you have Ogunquit's ugliest sweater? Prove it at the annual Ugly Sweater Christmas Party with a holiday show featuring Jon Richardson and the Vinegar Hill Gang.